It’s embarrassing to have gone to a restaurant like Launceston Place and think you’ve lost your photographic evidence. I dined here in August with the boy as we said goodbye to one of my best friends who was moving to Leeds. Fast forward a few weeks, a couple holidays, a business trip and all of the sudden I realised that not only had I not written about the wonderful experience, I had no clue where my pictures were. 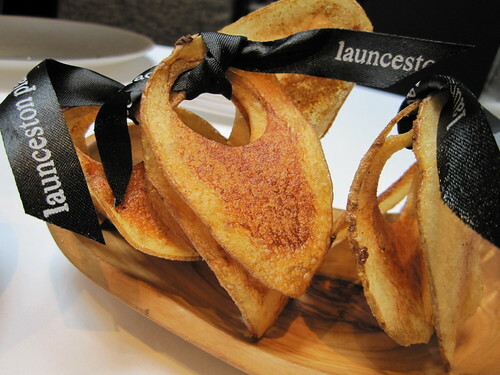 Luckily, they’ve been found and the review – while not at all timely with a summer menu – still holds true: Launceston Place was one of my favourite meals of the year. We all went for the three-course tasting menu, priced at an incredible bargain of £22. I love being surprised when presented with dish. This wasn’t at all what I was expecting it to look like, and it was so much more than the menu description lends itself to. The beef, thinly sliced and tender, wasn’t even the star of the show. No, it was the luscious risotto, vibrant in colour and rich in taste, topped with two slices of jellied salty bone marrow – the yang to the sweet yin of the beetroot. This starter was the epitome of balance in cuisine. Also at the table was the Duck Egg on Toast with Somerset Truffle, which I failed to get a picture of. I did, however, manage to snag a bite. It was heavenly. I’m not the biggest fan of mushrooms, but the rich nuttiness over a perfectly poached egg and crisp bread was wonderful. Such a beautiful dish, don’t you think? The pretty potatoes, the rich consomme and tender (yet crispy!) lamb made for an excellent main. It wasn’t made of particularly groundbreaking ingredients, but that’s not the point. It was a huge portion and all-around tasty. 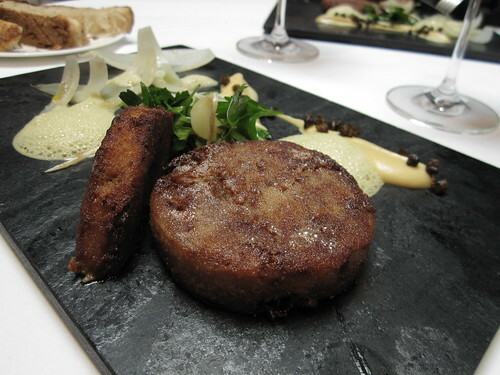 Crubeens, a traditional Irish dish made of boiled pig’s feet were served as a patties. I wasn’t sure what to expect of them. I’d never had trotters before, and while I will try almost anything once, I wasn’t sure about this one. I imagined them to be rather tough. Luckily I was wrong. The crubeens were salty, moreish and happily boneless. Beautifully presented, as well. This dish is made for two, and as it comes out of the kitchen in a GIANT pie pan, you can see why. It truly is massive. I ate every bit. For once, the boy who always gets cheese for dessert was truly jealous. The apples were so thick and sweet and tender. 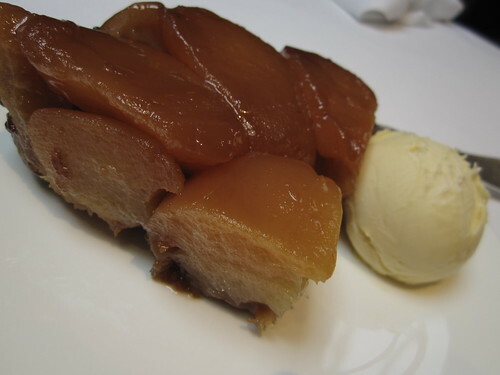 It was the kind of dessert that makes you squeak with glee every time you take a bite. Worth the £22 for lunch, right there. I said it before, but this is one of the best meals of the year. I loved every minute of it. Service was wonderful, price for food was a bargain and everything was delicious. With drinks, water and service it ended up being about £40 a head, which for the caliber meal we had, I’d say was worth double. Wow, this looks like a very good deal indeed. The menu reads deceptively simply and doesn’t hint at the sort of food you were served. If LP weren’t already close to the top of my ‘must visit’ list, it would be now. Grub, you really MUST go! I’ve been twice this year, once for the lunch set menu and once for the tasting menu (over lunch). Both brilliant experiences and both absolutely fantastic value for what they included, and service and ambience too. 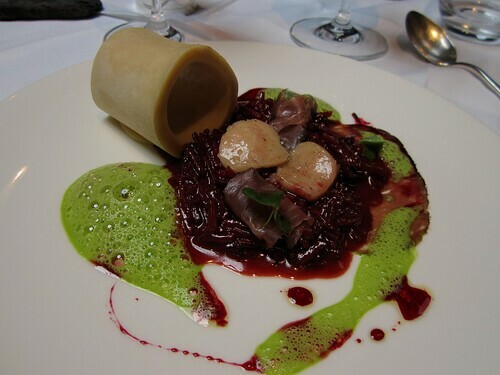 I LOVE Launceston Place, also one of the best meals in my culinary years. Will go back tomorrow for the lunch menu with my parents who come to visit. Looking forward to it even more after I’ve read your piece! Looks like an amazing experience and quite an amazing meal! !